Clothing Brand TwentyFour has Expanded into Small Boutique Inside of Hair of Art Gallery Salon — Carvd N Stone Inc.
Two young Black men, a clothing line, why not support? TwentyFour is a local clothing brand founded by Steven Bradford and Jurrele McDonald with the goal of spreading the ideology to use one’s time wisely. There’s twenty four hours in a day, how do you use yours? According to Bradford, the men used to make clothes that looked good to them, now it’s a mix between what they like and what the customers want. TwentyFour is a brand based on the season and trends. “It’s a blessing and a curse,” said Bradford. “Once you start catering to people, you have to stick to that,” said Bradford. They may release a shirt that’s orange, but the customers may want purple, so they have to adjust. Bradford says he likes to study trends and then create his designs from there. For example, he noticed the interest in sweat suits and joggers were at a high, so he decided to drop TwentyFour Tracksuits with his own spin. This year, TwentyFour has expanded and moved their brand into a small space in Bradford’s father’s barbershop Hair of Art Gallery Salon LLC located at 7532 W. Appleton Ave. Their clothing line now has a small boutique (UTIQUE UT + boutique) right inside the shop where they can sell directly to customers. Bradford sees this move as a stepping stone and admits that TwentyFour is still in its very beginning stages. “I’m really hard on myself,” he said about not always celebrating his accomplishments. Opening up an actual storefront is definitely high on their list, but there are many steps to be taken before then. Such as their presentation and how they brand themselves. 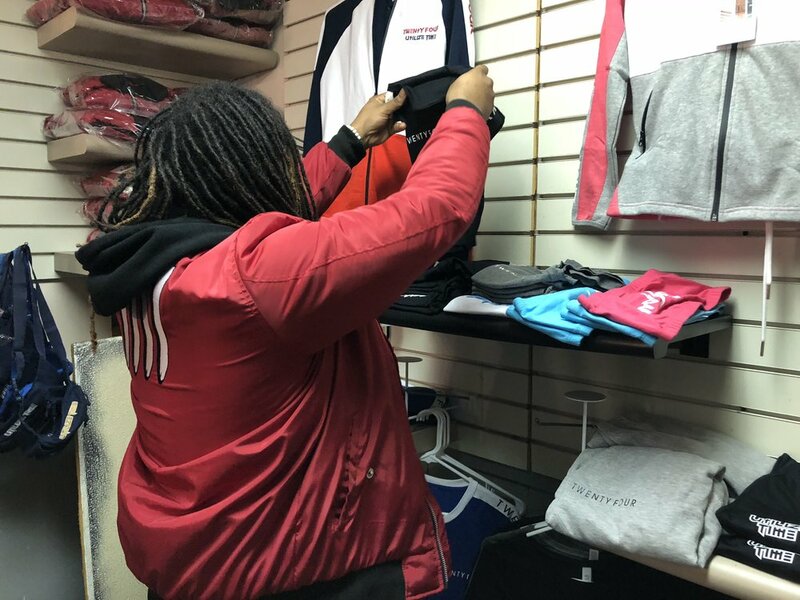 Starting in 2019, Bradford said there will be more TwentyFour photoshoots displaying their clothing line, and new and better designs. Just recently, TwentyFour released jackets with sizes for toddlers and babies. By expanding their sizes, they’re reaching an audience they haven’t tapped into before. TwentyFour is more than just quality clothes, it’s a lifestyle. The two men hope to inspire the younger generation to stay creative and have goals they want to achieve. Bradford says the younger generation are failing everyday, and it starts with receiving a quality education. They need mentors to show them that they can be their own bosses. He also said that if we don’t take control of our youth, then outside sources like the government will. TwentyFour also helps other entrepreneurs start their businesses up. Whether it’s designing shirts for a brand or giving advice, Bradford says he’ll always have a helping hand. “I can help people skip all of the BS,” he said. When Bradford and McDonald first began their journey to business owners, they received helped from a local clothing brand Low Life. He admitted that him nor McDonald wouldn’t know where to start if it wasn’t for that owner taking his time to teach them the ins and outs of the game. Now Bradford is just doing what was done for him by passing on useful knowledge to someone who needs it. Unlike others, Bradford embraces his failures because they make him a stronger person. He said too many people let their fear of failure stop them from pushing forward. But, it’s all about perseverance and seeing the dream through even when you can’t touch it yet. Everything you experience in life can be used at another point in your life, said Bradford. He remembers making websites for fun, now he has a fully-functioning website for people to order TwentyFour clothing. “The things I learned as a kid, all those things, came back in my adult life,” he said. To anyone 20 and up, Bradford said just execute whatever you have your mind set on. And anyone younger, stay productive and creative. Jurrele McDonald was not available in time for the article. To order TwentyFour clothing visit their site.